What a great, simple invention. As a competitive tennis player, using the finger exercise bands relieved my annoying, debilitating tennis elbow in short order and has kept it away for a long time. Also works for golfers who like to hold the club too tightly and therefore suffer the same pain. Strongly recommend. This pack is perfect for Sports Enthusiasts and Musicians, with already strong healthy hands looking to increase strength and flexibility or anyone looking to strengthen their already strong hands - Golfers, Climbers, Martial Arts, Tennis Players, Baseball Players, Football Players, Hockey Players, Rugby Players, Rock Climbers, Law enforcement, Military personnel, or basically any sport enthusiast or individual engaged in an occupation, sport or activity that depends on the strength and health of their hands. Begin with the Red and work yourself up to the Blue FlexEx to maximize your strength and give you an edge over the other guy! The Red FlexEx offers medium resistance and is suited for most individuals wishing to strengthen their hands, forearms and fingers. The Green FlexEx offers medium/hard resistance, and is a great step up to further challenge already strong hands. The Blue FlexEx offers heavy resistance and is suited for advanced users who wish to further strengthen their hands, forearms and fingers - for even more resistance, double them up! Use your FlexEx anywhere/anytime to maximize your strength and give you a competitive advantage over the other guy! 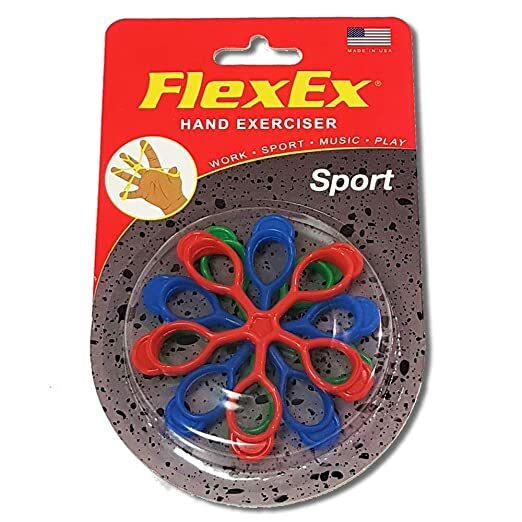 Strengthen your Hands and Improve your Sport with the FlexEx Sport! Proudly Manufactured and Packaged in the USA! Golfers, Climbers, Tennis Players, Baseball Players, Football Players, Hockey Players, Rugby Players, Rock Climbers, Cricket Player.